Still fabulous. Wish I had the skill to make this, and the body to wear it. Wonderful. This coat is SO freakin’ gorgeous!!!! I want to buy the pattern, but I am so much bigger than the size offered I just know I don’t have the skill to grade a complex pattern like this up to my size and have it look anywhere near right. But I so admire you & all of your patterns – you are so generous with your skills and knowledge! Thank you. What can I say, other than totally sublime. In awe of your skill in pattern drafting and making up the clothes. Thanks so much. Must check out the pattern and challenge myself to make it. So, so stylish. 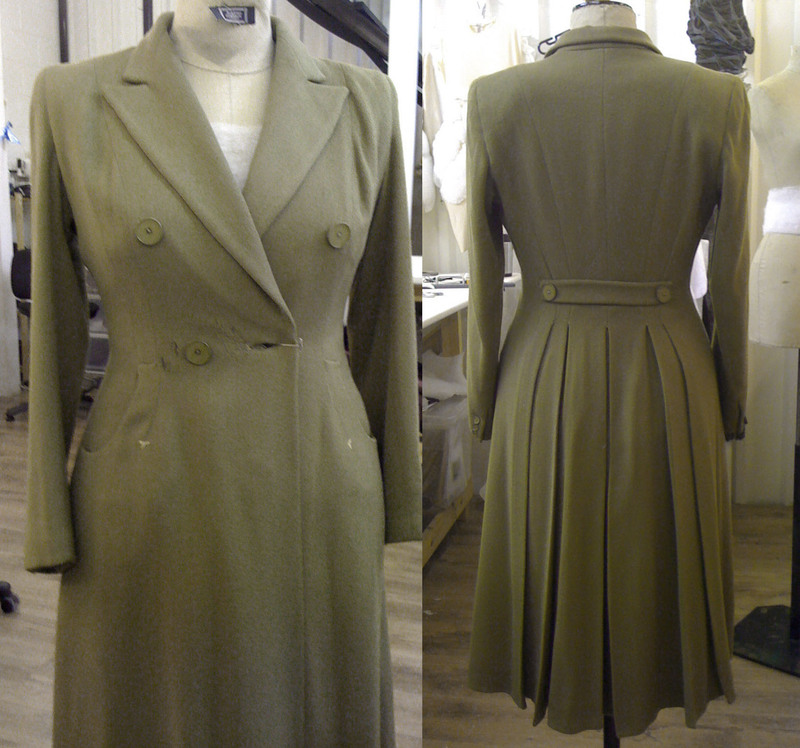 This is the most exquisite design for a coat I have ever seen!! I have always loved the 40’s, clothing, music, movies, everything about it – except that horrific War, of course – but I think the side effects of that War gave us some of the lovely designs we admire so much today! Its kind of a Catch-22 situation – the War gave us the need to design the clothing we had to wear, which turned in to some of the loveliest things ever, AND it basically yanked us by the neck out of the Great (?) Depression by establishing almost 100% employment, with a booming economy then and after, but it took so many things away from us and the rest of the world as well. Which would you have? Oh dear – I seem to have been derailed by another subject, so let me get this back on track again! The “reefer” style coat and the Princess lines have always been my very favorite style of all. It is so feminine and flattering on just about every body, including, and i think especially, us “fluffy” girls! It gives us a defined waistline, and that hourglass shape that is supposed to be the ultimate shape to achieve. I am tall, with long legs, and a lot more Coke in the bottom of my bottle than in the top, which has always been the case to some degree or another, but this style has always balanced me out! After I got married, (I was much more “well balanced” than I am now at 59,) almost 40 years ago the end of this month(! ), at the tender but still mature age of 19, and was finally able to shop and buy for myself what I wanted and for how much I wanted to spend (this was NOT how I grew up, btw) the first thing I did as soon as winter coats hit the racks, was I went shopping for the most beautiful coat I could find, and put it on lay-away! I gave my old ugly sacktype brown blah coat to the Goodwill. And I had the most beautiful deep Navy and gray with a touch of burgundy plaid wool winter cost with a hood and fluffy fur around the hood and cuffs. It made me feel like a queen, and I couldn’t WAIT to get it out of lay-away and for cold weather to hit, which I normally despised! But in southeastern Virginia, right on the Chesapeake Bay, sometimes we have a white Christmas and sometimes we get nothing all winter. Following that first winter, all subsequent winters have been spent in the blustery Midwestern state of Indiana, and my coat got quite the workout! After three hard winters, including the infamous Blizzard of ’78, I had my coat relined with a heavier fabric, on the sly, by my very talented (and sneaky) seamstress of a mother-in-law! She presented me what had suddenly become my “missing” winter coat a few weeks prior, all dry cleaned and pressed and completely relined in a more durable, good quality fabric I cannot recall the name of right at this moment. But it was all ready for several more winters! Eventually, and sadly, I wore it out, and had to finally buy myself a new one. By then we had a couple of children, about 2½ and 9 months, so money was a little tighter than BK (Before Kids). My coat wasn’t the grand affair I had started out married life in, but it kept me warm, and my husband was congratulated by his pals for having such a frugal wife who didn’t need to.go out and buy a brand new coat every winter! I saw this originally on Pinterest, and started to repin it into my 40’s board, but something made me stop and check it out, which isnt that unusual for me. But something about this just said “Stop!” and check it out. After reading your story about its creation, and many of the comments made since it first got posted, the only thing I can say (after everything ELSE I have said!) is that you have an amazing talent that i can only sit back and admire from a distance! I won’t ask you anything about a pattern, because this is obviously so far above my inadequate abilities and sewing talents that I wouldn’t know where to begin! And i am too disabled now to learn. The only thing I can ask you about is “do you make such things for clients?” The coat I mean! But I’m sure the amount of work this requires, obviously (you gave a three day time frame) it would be quite out of my budget and, per one other young lady’s comment here, quite out of my size range! That’s a real shame, as I’m sure we could probably provide you with a goodly chunk of your income for doing such things! There are no tailoring establishments around here which cater to us “fluffy” gals that I’m aware of, and I am certainly not up to hunting any down at this point in my life! My goodness – this has become quite the novelette, hasn’t it? It’s amazing the effects one garment can have on someone’s life, isn’t it? I will find a good place in which to repin the image that brought me here, so that I can find it whenever I want to look at the most beautiful coat in the world! Well what can I say but a big thank you. I’m so pleased my coat has inspired you to write. Your 70’s outfit sounds wonderful… knee high boots and all! I’m the same age as you…. and had a lot of fun dressing in the 70’s. What a lovely thing your mother-in-law did for you too. I think is it rare that clothes get the extended life by dint of re-lining or reworking as they did in more frugal times- which actually seem to be on us once again both sides of ‘the pond’. At least it seems more people are learning to sew again so that’s a good thing. As to sewing for others I’ve recently stopped virtually all my private bespoke making and just do some costume making due to arthritis in both hands which has become quite bad in the last 6 months. Pattern drafting is less of a problem in terms of my hands so I am turning more to just doing that for both costumes and my own patterns, more of which I hope to be selling fairly soon. I absolutely love this!!! I would love the pattern if there is one, I know how to make patterns and alter them for size but this style is perfect!! I adore the lining – so cheerful on dreary days! Out of curiosity, what fabric did you use for your muslin? Thanks, Megan, something other than a solid colour matching lining just adds that much more pleasure to the wearing doesn’t it. As to what I use for muslins- in general just a tightly woven unbleached cotton but for a coat toile I like to use heavier cotton drill. Hi Alison, thank you! There is a pattern but not yet for sale. This coat is incredible! Absolutely STUNNING! Did you put the pattern up for sale anywhere? I’d drop everything to buy it if it’s available! I would be interested in a Pattern also. Hello. Is the coat the same used on Outlander. Claire Randel wears? No it’s not the same coat. I made mine almost 3 years ago. But they do look very similar don’t they! I will and aiming hopefully sometime this Fall … in it’s current form it is proving a challenging make for the few people I have let try it so far. I need to do a slightly simplified version! I love this! I have read through many comments and join the chorus of wanting the pattern. However, I have the advantage of having learned flat pattern drafting. Sadly, struggle with draping. I know how odd this sounds. I think I may attempt this one, perhaps after Christmas. I can’t wait! Have I mentioned, I love this? Hi Gretchen, well flat drafting a coat like this would probably be a chinch for you. Over the years I’ve met quite a few cutters similar in that flat drafting/not draping respect. I took to draping like a duck to water and adored my draping instructor but went to my flat drafting classes only enough to barely pass- that teacher was scary! It took me a few years of being on the job to finally get my head around flat drafting. Now I comfortably use a hybrid of both but still turn to working on a mannequin when I need to figure something out. In regards to the 40’s coat pattern- my reticence in putting the pattern out is mainly because writing the ‘how to’ for a 27 piece/3 day make is something I personally find quite a daunting prospect! I really love your coat. I was wondering whether you have a free pattern that I could use to make one for myself. Hi- I’m sorry but no, this pattern isn’t one I’ll ever be giving away. Lol yes the pocket is tricky 🙂 it’s a 28 piece pattern and definitely needs good instructions. Its another one I plan on going commercial with … if my grand pattern plan ever gets further than that one bra pattern! perfection, yep I would push all else aside to make this! love the styling too. Thank you 🙂 I’ll let you know if I ever get the pattern digitised! Oh please only if and when you find the time – I know how that is! This must be my dream coat! Great job and fantastic details! Thank you! It remains my absolute favourite coat too. I hope to make a second one in another colour soon. LOVE LOVE LOVE this jacket. I am in awe of your talent. It’s too bad there isn’t a curvy girls version-I’d love to rock the heck out of it 🙂 Hooked on your blog now. Seriously beautiful work! Might be a copycat, but it does look stunning! This is probably the prettiest coat I’ve seen in a long time. I think it looks even better than the original!